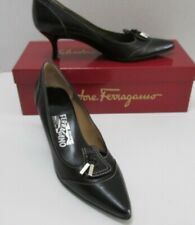 Used salvatore ferragamo women shoes size 9. Took picture of where there are marks on the shoes. Low block with round toe. Length: 10". Width: 2.5" (Narrow). The material has a grain textured look and feel. The color is a very dark brown and almost looks black. These are preowned and has scuffs due to normal wear. Soles are in good condition. Pointed heel with gold piping detail. Maroon red suede outer. Leather Sole. Condition: Gently used. There are black marker markings on the undersides (see photos). Free of holes or stains in the suede outer. An excellent condition look atpictures for quality size 9.5 a2. Color: Black. Size on label: 9. Black color. Good used condition. Moderate wear on bottoms and light wear on insoles. Nice overall. Note: The bow is navy blue. Heel is 1 1/4". The actual color of any item may appear different in person, depending upon your computer or phone settings. Very good pre-owned condition. They are made of a very soft suede material and have leather soles. Overall really good shape and lots of life left in them. I like the detailing on the top edge of the foot. It just gives the shoes a classy look.